At Green Lake, we get to make engagement rings that really challenge creativity and test technical ability. Pieces start out as wild ideas that are eventually translated into the perfect ring for our clients – picking ‘favorites’ is near impossible, which is why we post our work at least twice daily on Facebook and Instagram. 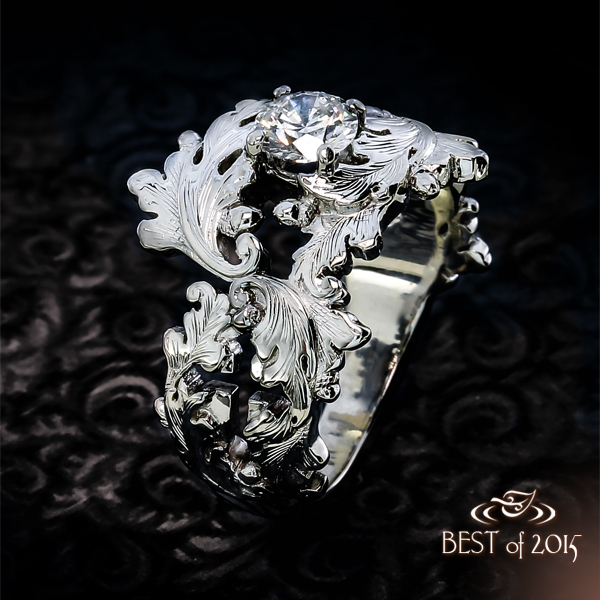 Still, there’s always a short list at the end of the year that includes some truly unique rings. These are the pieces that really pushed our limits to source the rarest materials, squeeze in the tiniest details and invent brand new techniques. So here they are, in no particular order, some of the most unique engagement rings of 2015… Enjoy! 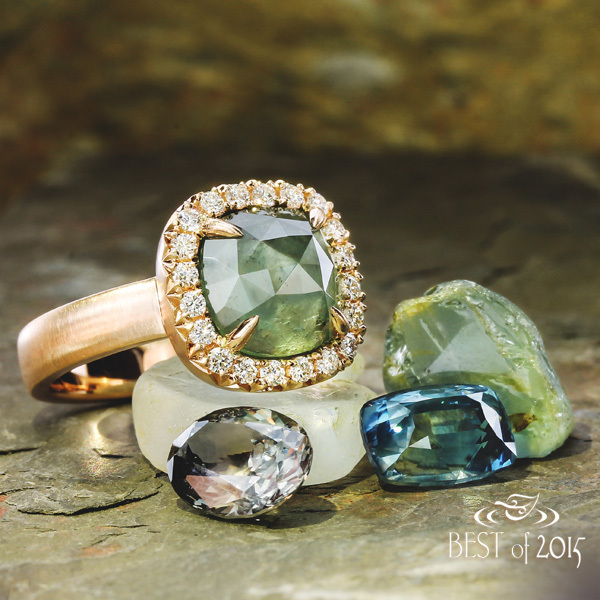 2015 was a year for the Montana sapphire at Green Lake Jewelry Works. After forging direct relationships with artisanal miners through site visits to the region, the gem lab began sourcing premium crystals to be custom-cut right here in the Seattle studio. With a new lapidary station in the workshop, Graduate Gemologist Dan Canivet collaborated with Design Group Director Krista Robertson to create an array of one-of-a-kind rings that put Montana sapphires in the forefront. 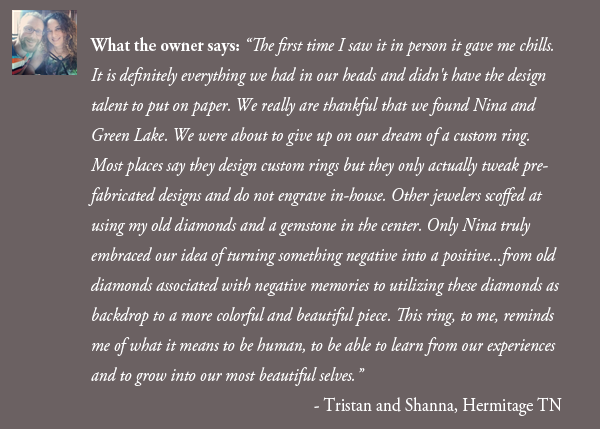 Since then, Green Lake quickly became known as shop specializing in not just custom jewelry, but custom-cut gems too. In the Seattle studio, our Montana collection features finished pieces as well as responsibly mined rough crystals for clients interested in starting a ring from scratch. This particular ring embodies an entire vision for pieces crafted in the workshop: It was designed just for Green Lake’s clientele, it showcases a gem hand-cut by a skilled lapidary, it’s cast in house using recycled materials and features a style of setting in the halo achieved only by master craftsmen. What’s more, it proved to be an especially popular design too! To see more on this ring, visit the Client Gallery. To see it see it sparkle fresh off the polishing wheel, see the Green Lake Instagram. Platinum engagement ring featuring an 18k gold grasshopper with a 2.76 ct round-cut diamond center, 11 melee diamonds bead-set into the gallery, wheat engraving and milgrain edges, and filigree curls on each side. 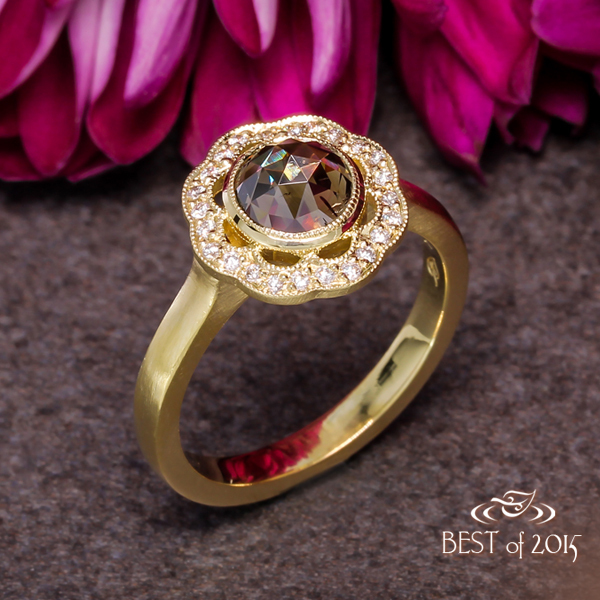 This ring gained serious attention nationally when it won the annual Vision award in May from MJSA – the U.S. trade association dedicated to professional excellence in jewelry making and design. It’s the result of a client seeking to re-purpose an heirloom, a designer tackling real challenges of scale and a workshop of artists uniquely qualified to execute on its one-of-a-kind aesthetic. The process of design for this piece is covered in its own post from earlier in the year. One area of note that hadn’t been mentioned, however, was the role that computer-aided design (or CAD) played in this ring. 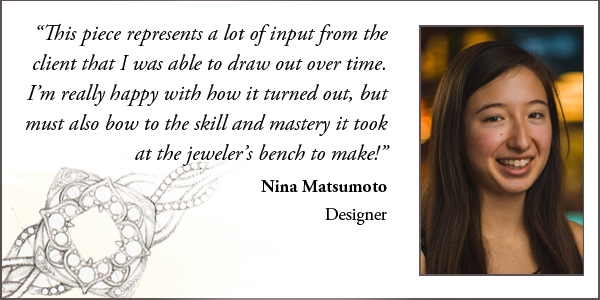 Crafting a minuscule, life-like grasshopper in gold was no easy feat and required a bit of finesse from CAD designer extraordinaire, Kelsey Kudriavtseff. 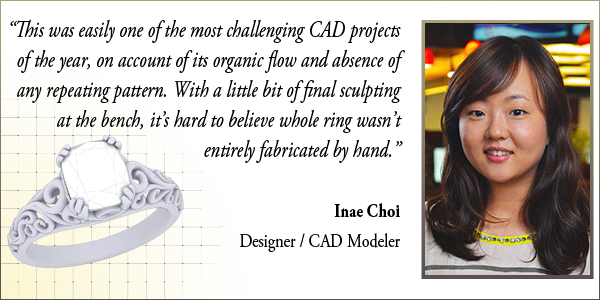 Despite a routine of structural jewelry design, Kelsey was able to shift gears and adapt to a much more organic objective. 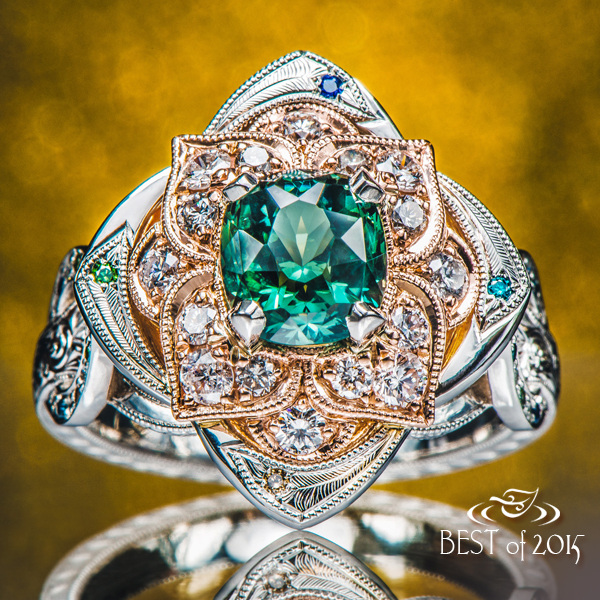 To see more on this ring, visit the Client Gallery. To read more about this custom design, see the MJSA article. Custom made platinum ring with claw prong set diamond center and diamond melee bead set with milgrain edges. Pierced open panels on top face with filigree curls form heart shapes along the sides. Here’s a kind of ring difficult to find outside highly skilled custom shops like Green Lake, because the pain staking attention to detail is unfeasible to mass produce for big jewelry lines. For this ring, the client really wanted a perfect balance of Edwardian-inspired old world detail with simple, efficient design. 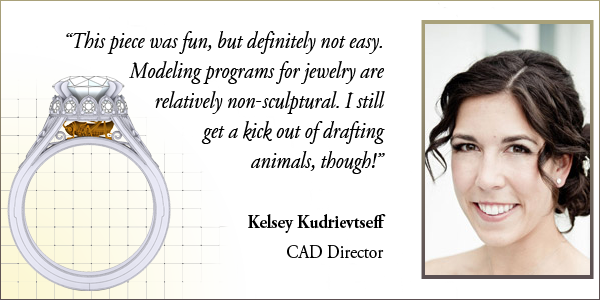 Senior designer and graduate gemologist Sophia Shen set to create a low-set yet especially elegant ring to communicate all the swirls and curls associated with the period, without it being overly heavy – the result is stunning. At the bench, veteran gold and platinumsmith Henry Nguyen snapped photos of his work step-by-step, which are on display in the Client Gallery. For the filigree, Henry started out first with the larger pieces, ensuring even space throughout. Then he fabricated each leaf by hand and delicately worked in smaller filigree details (‘filigree,’ by the way, is defined thoroughly in our Custom Options section). 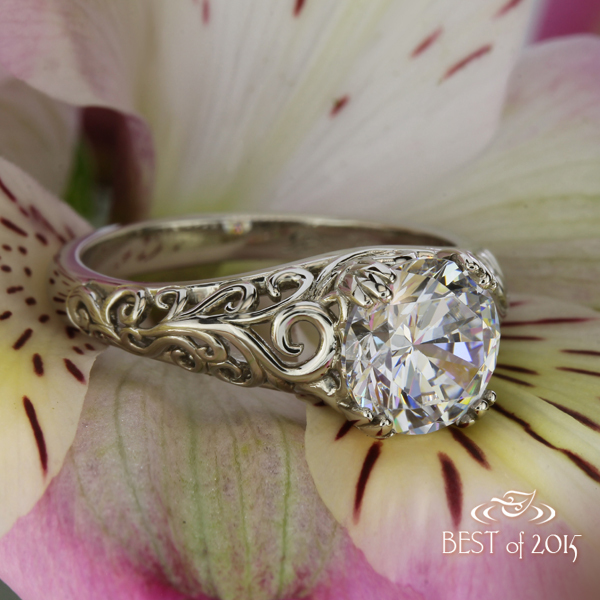 To see more on this ring, visit the Client Gallery. Custom made palladium feather ring with diamond center and accent gems bezel-set in the side face. 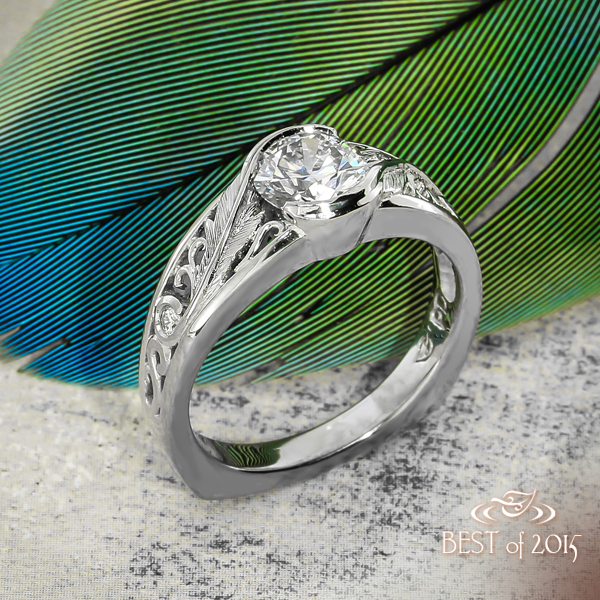 This ring is all about sensible design and subtle details. The client who commissioned this piece works with her hands in her job, so it’s set low without prongs that could otherwise catch. 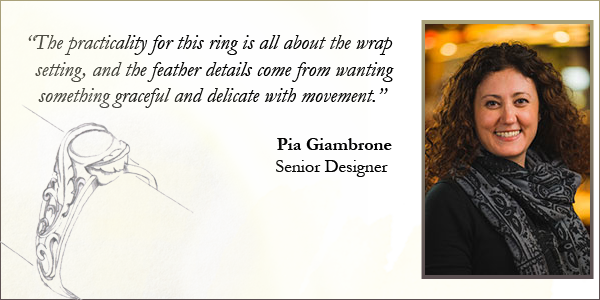 Just as pictured, the feathers on the ring are finer – and on a much smaller scale – than an actual feather. That’s pretty detailed! To maximize its look without being overly top-heavy, the diamond halo on this ring was widened while remaining open with a scalloped frame. It showcases a uniquely champagne colored rose-cut diamond at its center, boasting warm sparkle throughout. Green Lake Gemstone Director Brant Kane with Designer Krista Robertson selecting the finest rose-cut diamonds. With its Bohemian feel and unique display of color, this ring is especially iconic of the popularity rose-cuts have enjoyed in the studio this year. 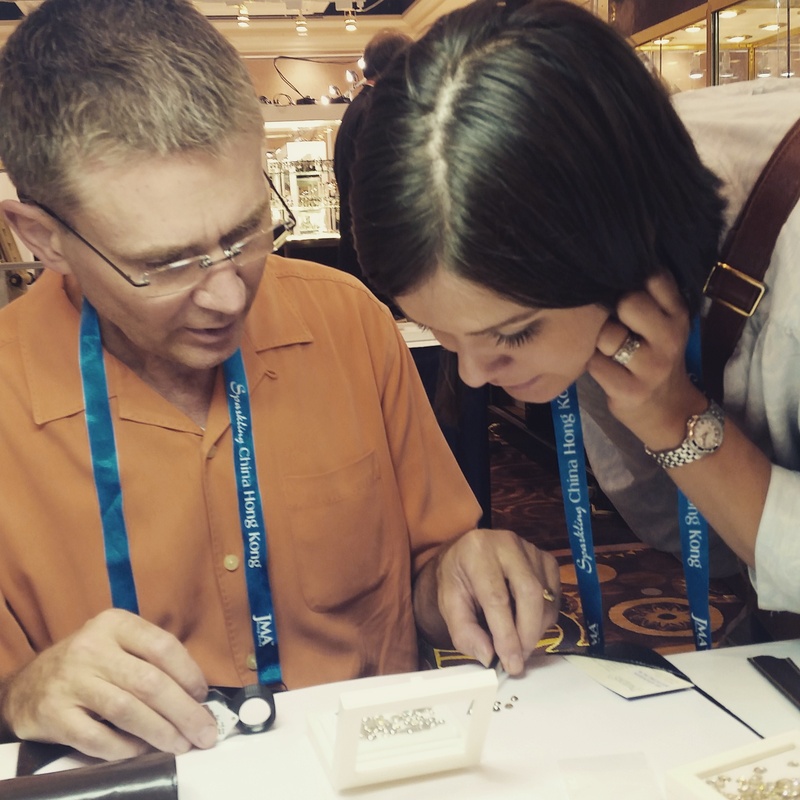 In spring 2015, Green Lake’s Gemstone Director Brant Kane and Designer Krista Robertson met once again with diamond cutters who’ve been producing gems this way within communities of legacy tradesmen since the style’s inception over 500 years ago, in India’s Mughal Empire. Unlike conventional diamonds most expect to see (with deep pavilions and subtle crowns to flash with as much scintillation as possible), rose-cuts are flat on the bottom with facets that rise high like a budding flower. These one-of-a-kind natural colors – from deep, coffee tones to bright citrus to rusted inclusions that lend rosy hues – attract many custom engagement ring clients to the style. Finding them however isn’t exactly easy, which is why Green Lake pours over gems right from the source to select only the prettiest diamonds to bring home to the studio. To see more of this ring, visit the Gallery Detail Page. To see more rose-cut diamond engagement rings, visit the Gallery. 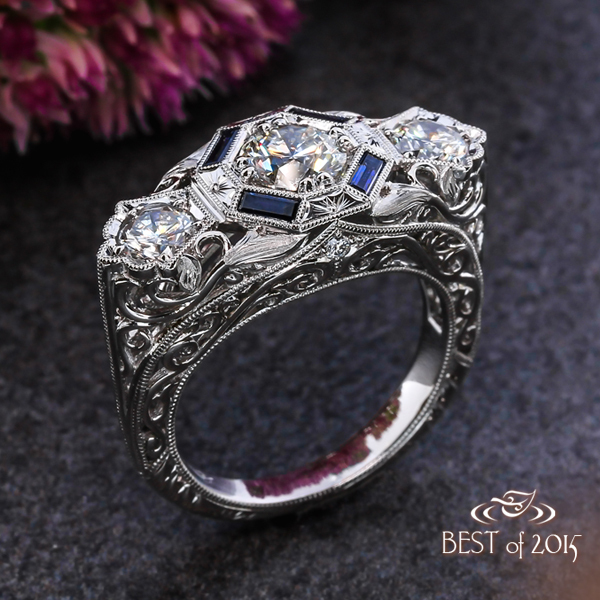 Antique inspired diamond ring in platinum with baguette-cut sapphires and engraved motifs as a halo. For this ring, the client approached Green Lake after a lengthy search of estate pieces, only to discover the exact style of ring she wanted simply wasn’t made in the 1930’s. She wanted a 3-stone ring with the clean geometry of an octagonal setting, but replete still with fine, old world details so as to appear die-struck. What’s more, she wanted a ring that sat low on the finger, and flush across the top. As with some especially specific custom designs in the studio, exchanges spanned 6-months start-to-finish but the results speak for themselves! It was at the bench of masterful gold & platinumsmith Sungwoo Hong that this piece was at last complete, where he snapped the very first images and uploaded them to his popular Instagram. 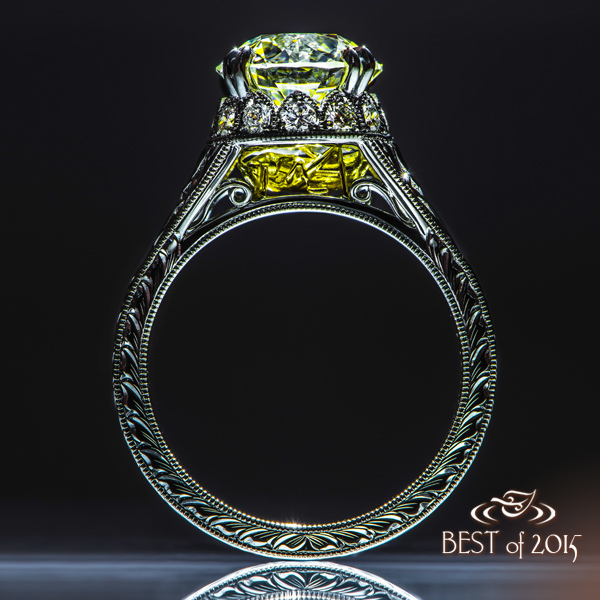 To see more of this ring, visit the Client Gallery. Four claw prongs hold a gleaming cushion cut diamond while a blend of cast and hand engraved scroll patterns curl throughout the design of this demure engagement ring. The most popular piece on our Cool Engagement Rings Pinterest board this year, this ring captures the all the daintiness of hand-fabricated filigree while maintaining the sturdiness of a cast piece. Moreover it demonstrates a focus on its diamond center as any well designed solitaire should, yet subtly boasts much more interest down the side face – making this ring a true one-of-a-kind. 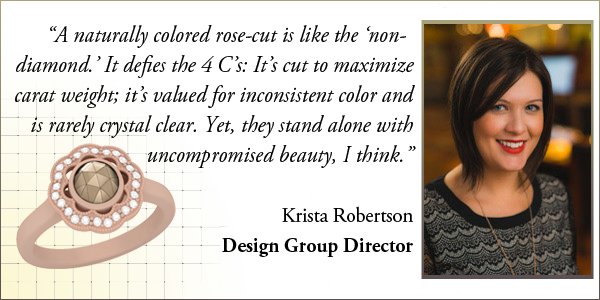 One common question new clients to Green Lake often ask is how long it takes to have a custom ring made, which from initial sketches to a finished piece is typically between 4 to 6 weeks. 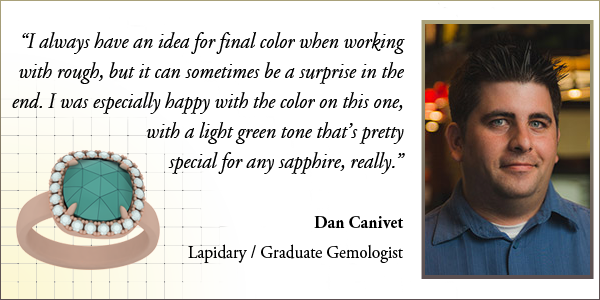 This however is not always the case as the process of design and discovery personal aesthetic is different for everyone. 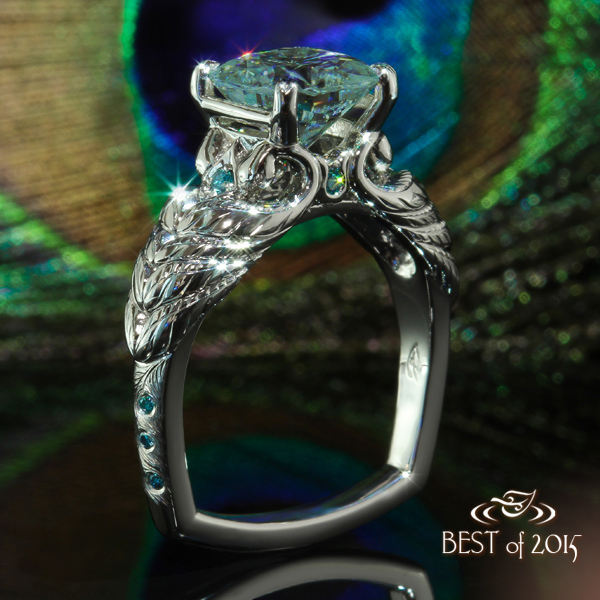 Take for instance this stunning peacock inspired setting, carved of platinum with a hand-cut Montana sapphire center – it took over a year of steady collaboration to create. 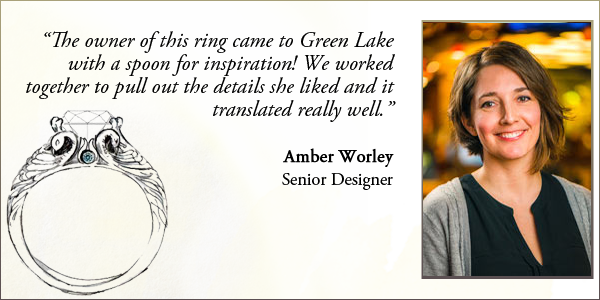 With a decade’s worth of experience metalsmithing herself, Senior Designer Amber Worley facilitated the relatively complex process of all the evolving iterations, model-making and gem cutting that went into creating this ring with thoroughness and exactitude. The resulting piece proved well worth the wait for a client updating her engagement ring for a wedding anniversary, and more than willing to hold out for perfection! Custom made platinum ring holding a 4-prong set round diamond center. This piece has pierced wrapping leaves with hand engraved detailing. For traditional jewelry engraving, the ‘English scroll’ serves for a predominant motif. 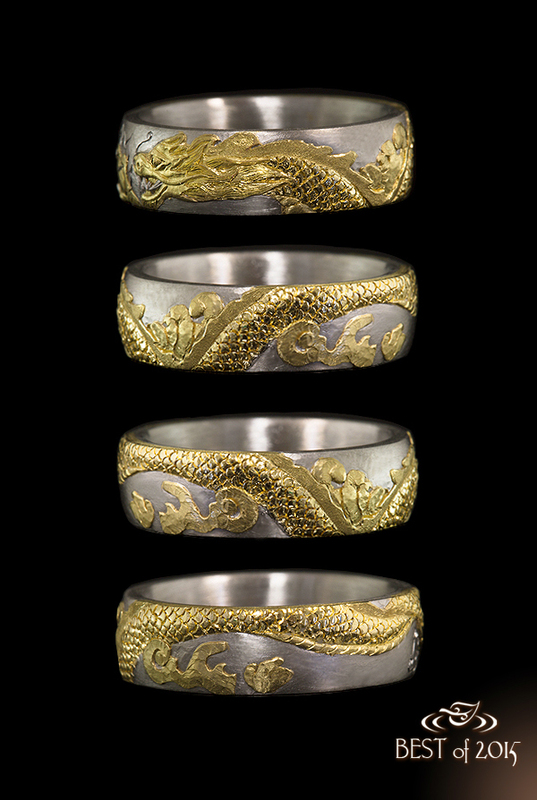 This ring however is especially unique because it doesn’t just incorporate the motif; it is the motif. First modeled in a 3D drafting environment, the shape for this ring was then created layer-by-layer using a specialized printer, before it was finally cast in platinum. 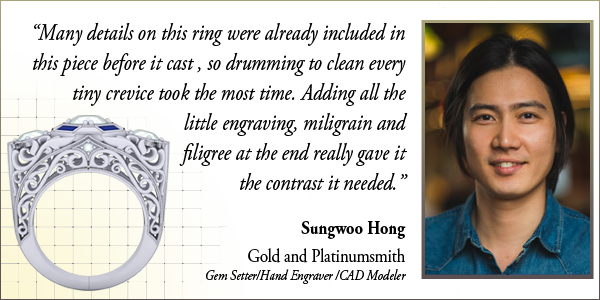 The fine details that lend it that ornately engraved look were applied last at the bench by accomplished metalsmith, Celeste Tracy. To see more on this ring (and its hidden detail of a cross on the side), visit the Client Gallery. 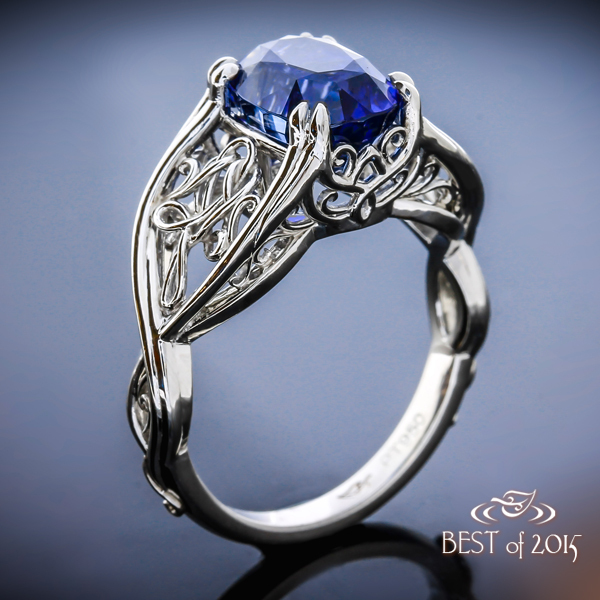 Custom made platinum ring with dazzling cushion-cut sapphire center and hand fabricated filigree accents. Many ideas for rings in the studio are motivated by architecture, and this piece pulls from some of the most romantic architecture around. Straight from the city of love, that Parisian Art Nouveau-era metalwork served as direct inspiration for this piece. 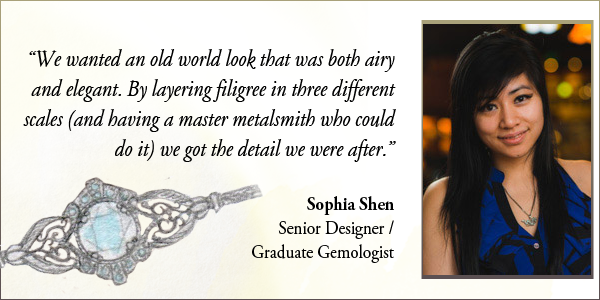 To capture all the twists and whips for which the genre is known, designer Sophia Shen put hand-fabricated filigree in the forefront, pushing the limits of metalsmithing for such a miniscule scale. The resulting ring is as sturdy as it is delicate, offering another stunning example of the workshop’s most unique pieces of the year. Platinum and rose gold with a cushion-cut Montana sapphire and diamond halo; peacock feathers inspire delicate engraving and a sparkling array of colored diamonds and sapphires. With one wedding in China and another Stateside, the global couple who commissioned this hand-engraved band wanted to tell the story of their love. The wearer was born in the year of the dragon, one of 12 animals in the Chinese zodiac calendar, so the motif on this piece is especially personal. From the floating clouds to the flaming pearl in its clutch, designer Samantha Laddin ensured this this golden dragon was true in every detail to a traditional Chinese depiction – only here, on a really, really small surface! 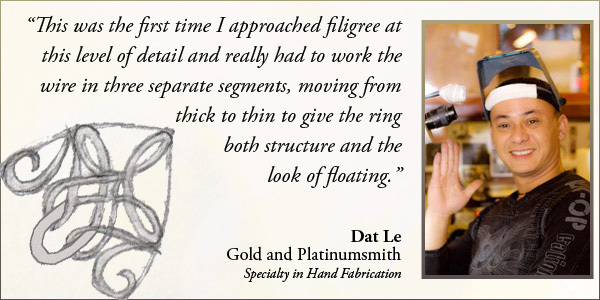 Like many rings crafted in the workshop, design for this piece hinged almost entirely on expert execution. 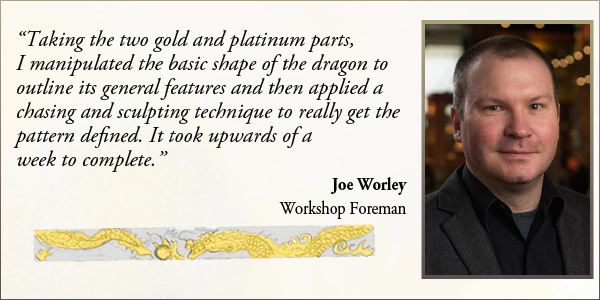 Enter Metalsmith and Spectrum Award-winner Joe Worley, who approached the project with a similar technique and attention to detail as he’d previously done in 2014 with the Koi Ring. 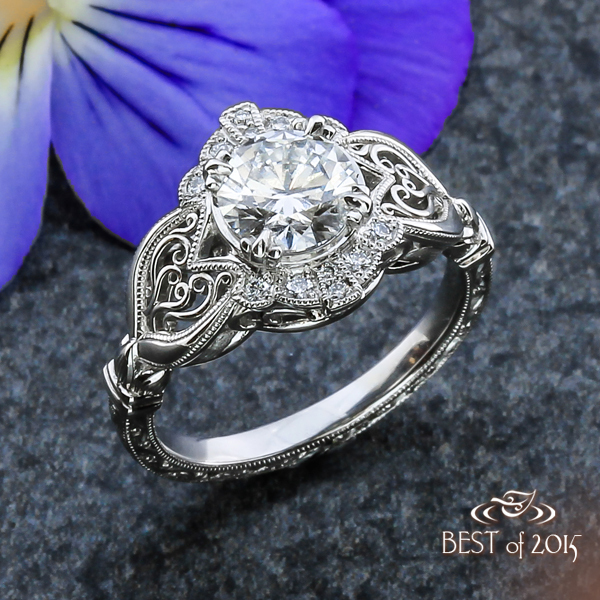 The finished ring proved to be one of the year’s most unique productions as it’s precisely a one-off, one-of-a-kind. Woo-wee! That is a LOT of beautiful rings to take in, each with their very own story. Thinking about having your own engagement ring or wedding band made just for you? 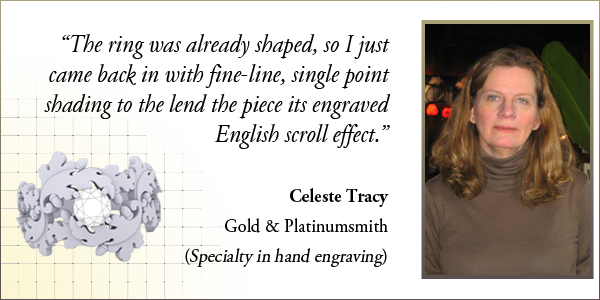 Contact us directly at info@greenlakejewelry.com or begin your own Design Page to get your idea started today.